There’s not a long involved or funny story to tell with these. I didn’t taste one until 10 years ago or so and then only when a restaurant used them as an ingredient. I enjoyed them, but didn’t fall under their spell until I actually cut one open for myself. That’s when they bewitch you with the combination flavor and fragrance. 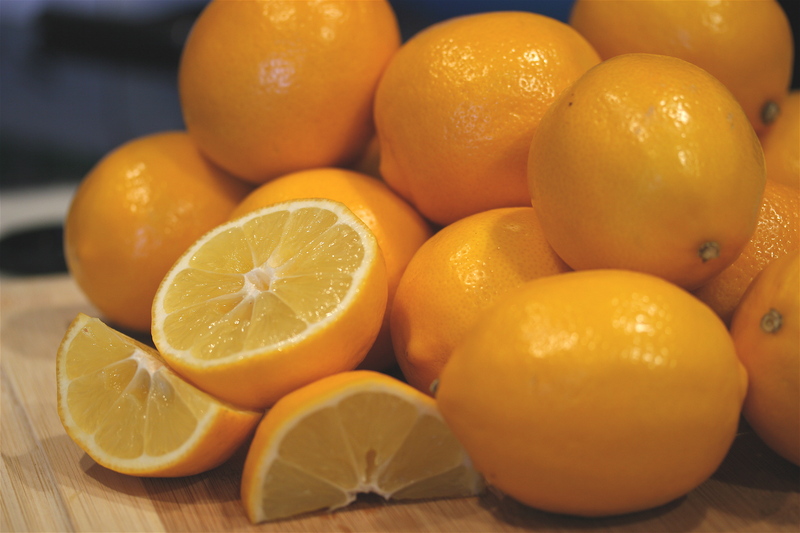 A lemon that you can actually eat a segment of and not have you shudder or make your face contort. Now I want to use them in everything. I’ve done everything I can to make them last. I have them preserving, and I’ve zested, squeezed and frozen them. And I’ve made them into marmalade. I’m planning on using this in all different ways, mixed with herbs and drizzled over chicken, spread on top of cream cheese (I”m thinking an english cucumber slice, a smear of cream cheese and this would be awesome), cake filling, and I’m thinking a warm teaspoon along side a dollop of creme fraiche in spring pea soup would be wonderful. 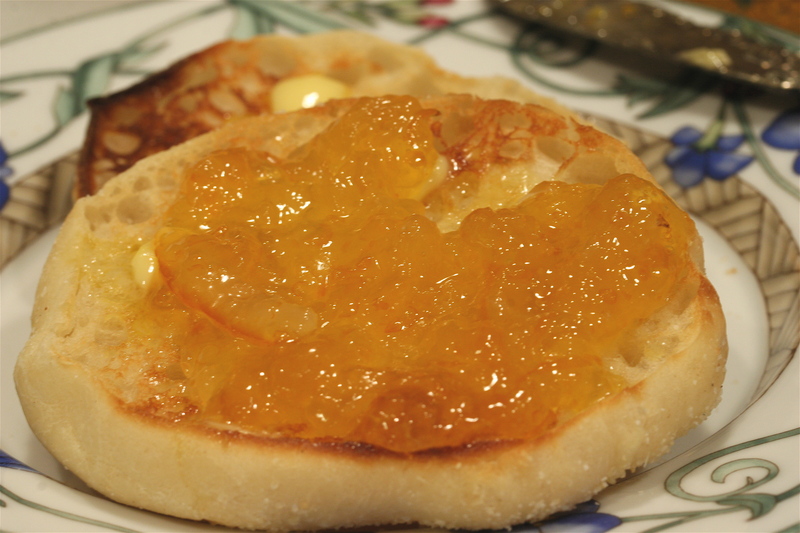 There are several ways to do this, what I did is perhaps a bit more fussy than necessary, but I wanted this marmalade to be more about the taste than the texture. 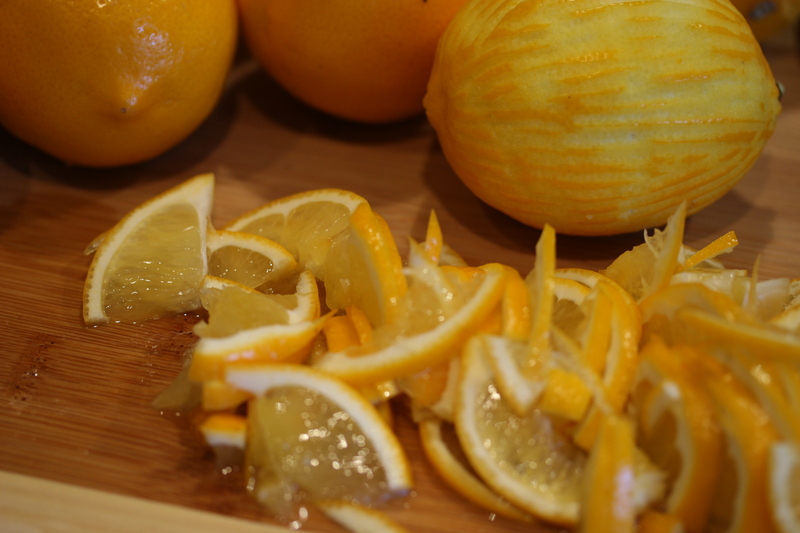 I took two of the lemons and quartered them, removed the seeds and cut them into thin slices. Two more I used a zester and took long, thin peels of the skin off and then used a technique called supreme to remove the segments. The remaining lemons, I used a microplane and zested them and also supreme the fruit. I saved all the seeds, cut away the center core of the sectioned piece and tied them in a doubled section of cheesecloth. I put all of the fruit, zest and juice in a bowl, covered with the 6 cups of water and let sit, covered overnight. The next day, I put the bowl of fruit and water into a large pot, add the sugar and brought it to a boil, then lowered to the temperature a bit and let it cook for 45 minutes, stirring frequently. I turned the heat down and removed the cheesecloth and let it cool until I could comfortably handle it, and then squeezed it over the pot. 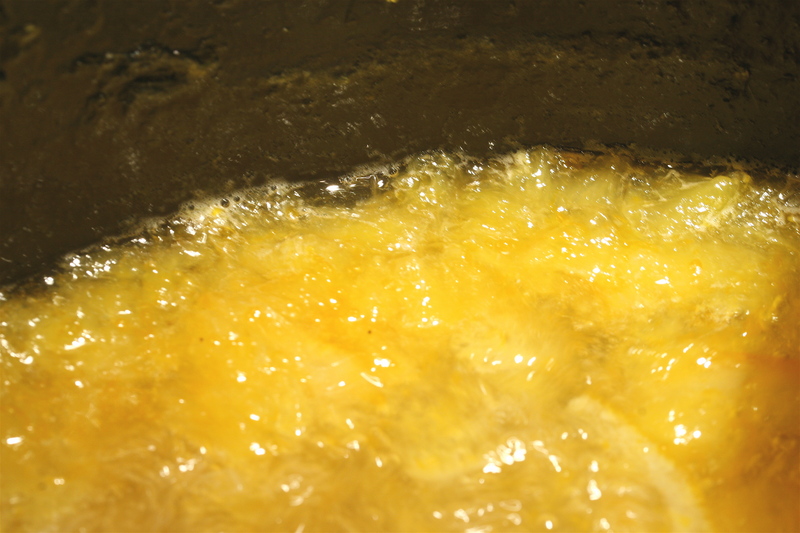 This releases the remaining pectin in the seeds and membranes and will help the marmalade to set. It will be milky and a little thick, just stir it into the marmalade. Increase the heat until it’s softly boiling and cook until it’s thickened. You can use a cold plate to see if the marmalade is ready, put a saucer in the freezer, when you think the marmalade is done, remove the plate, put a spoonful of marmalade on the plate, let it sit for a minute and push with your forefinger, the marmalade should wrinkle up as your finger moves forward. Or just let the marmalade drip of the spoon, turn it over and run your finger down the middle of the back of the spoon, there should be trail that doesn’t fill in. I then ladled it into the canning jars I choose and used the boiling water method, so I could keep it unrefrigerated for months. I might have to try marmalade. Hi Fran, sorry about the lemon blight. I bought the pricey ones, couldn’t help myself. Had to have some this year. I filled the freezer with juice, & zest, preserved some and then did the marmalade. A bit crazy! I loved your post on the lox and bagels! Great job!